It is true that very few people actually understand this subject or even know how a “Cat” looks like. The engine’s exhaust emissions can be influenced at three points. The first option is to adjust the mixture formation. The second possibility is internal modifications in the engine itself (such as optimised combustion-chamber design). The third alternative is post-combustion exhaust-gas treatment downstream from the engine. The chief priority on the engine’s exhaust side is to complete combustion of the remaining unburned fuel. The converter supports secondary combustion of Carbon Monoxide (CO) and Hydrocarbon (HC) to form non-toxic carbon dioxide (CO2) and water (H2O) while simultaneously reducing the exhaust-gas-borne nitrous oxides (N2O) to neutral nitrogen (N). Catalytic treatment is much more effective than processes such as purely thermal secondary combustion in which pollutants are burned out in a hot flame. The catalytic converter assists in converting over 90% of the pollutants into harmless constituents. The three-way catalytic converter reduces all three pollutants – CO2, HC and N2O – at the same time. It features a tubular ceramic support surface with a noble metal coating that usually consists of platinum and rhodium. The platinum and rhodium accelerate the chemical reduction of pollutants as the exhaust gas flows through the unit. A blocked or destroyed catalytic converter will definitely reduce the power output and negatively influence fuel consumption. 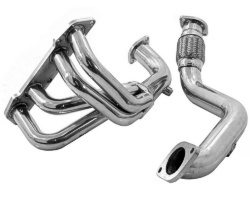 If a catalytic converter is installed, it is essential that unleaded fuel be used, as lead destroys the catalytic properties of the noble metals. The point is that leaded fuel and catalytic converters cannot work together.